Last week I was in the small town of Cuba, Missouri doing restoration work to a series of Civil War murals I painted five years ago. Cuba had an especially wet spring, and water had found its way behind the panels and damaged the paint film in places. 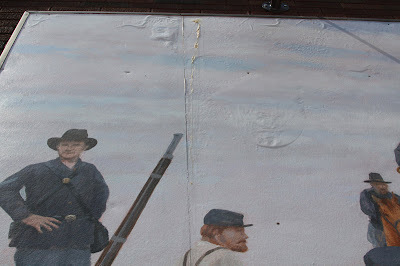 For some reason, the last mural on the right had the most damage. Water pooled behind the concrete board at the top and bottom edges, saturating through and removing the paint film in places. It looked real ugly, with water "blisters" forming and bulging the elastic paint film out as much as three or four inches from the wall. 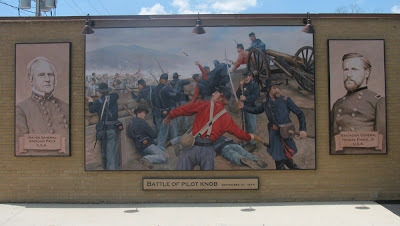 The Civil War event I depicted revolved around the 1864 Battle of Pilot Knob, Missouri. 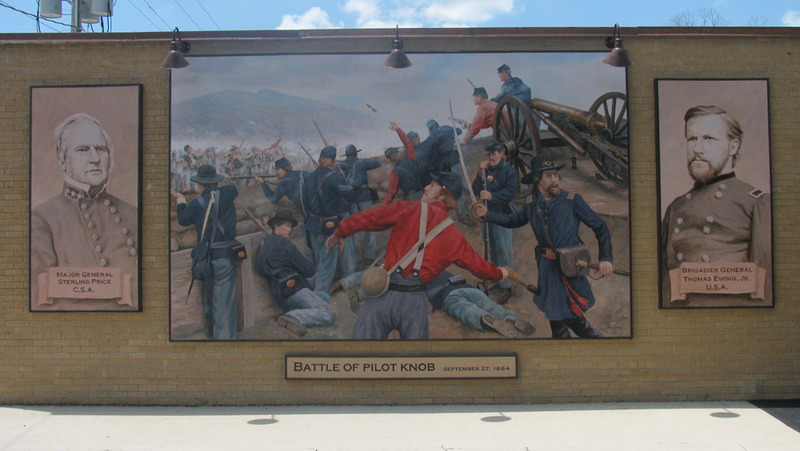 A small garrison of about 800 Union soldiers under General Thomas Ewing defended Fort Davidson against repeated attacks by about 12,000 Confederate troops. Nearly 1000 Confederates were killed in three frontal charges. Knowing it was only a matter of time before they were overwhelmed, Ewing decided to try a desperate escape. They wrapped blankets around the horses feet, as well as over the wheels of the cannons they took along. In the dark of night the entire command, along with about 150 civilians from the nearby town, walked out of the fort, right through the surrounding army. Not a shot was fired. Apparently the Confederates mistook them for their own troops in the darkness. The next morning, when the rebels discovered they had been duped, about 5000 cavalry set off in pursuit of the Union troops. 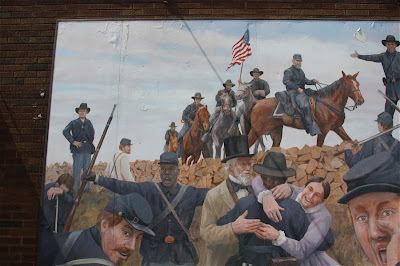 Ewing's command moved on roads and trails through the thickly wooded hills as much as possible, which made it difficult for the cavalry to flank and surround them. It was a running fight, with numerous rear engagements. 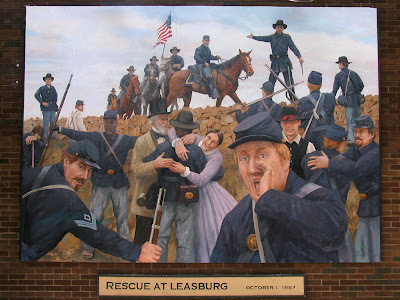 The forced march covered 66 miles in 39 hours and ended in Leasburg, when the Confederates finally gave up the attack, just as Federal reinforcements arrived. WOW, Don, after the calming shell drawings, this story is a real kicker of an adventure tale of man's innovative creativity in a completely different arena of life! I'm so glad for you that the restoration was mostly in the sky areas. Murals can take quite a beating outdoors. They are masterfully done. LOVE the use of the guy in the red shirt especially! Beautiful! Thanks for sharing these Don. Your talent is so amazing. Great job. Don, The murals are really wonderful! Great job! Stephen--thanks, that means a lot to me. Thanks for that, Ruth--much appreciated. Fantastic murals! I like the story too, My father was a Civil War buff and visited the battlefields over and over. Thanks, Mary. The project was interesting but pretty challenging--gave me a lot of respect for historical illustrators. This particular story really fascinated me. I think it would make a great movie.